Sometimes JOIA frustrates me with their flavors. They’re always well paired, but they challenge me to the point where I can’t honestly win. Today’s flavor combination is Grapefruit, Chamomile, and Cardamom. What? Of course I know what grapefruit tastes like and surely I’ve had chamomile tea, but combine all that with cardamom and I don’t even know what to expect. I’m going to try something today. I’m not going to mention any of the flavors listed on the label when reviewing this drink. Should be easy for chamomile and cardamom… not sure I can do it without talking about grapefruit. Let’s find out. 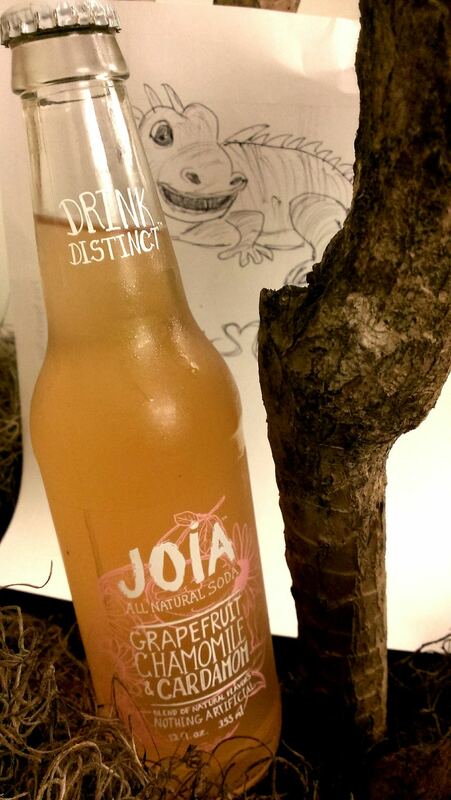 Oh yeah, JOIA is an all natural beverage for those of you interested in that. The scent is that of an overly citrus tangerine. There’s a bit of flowery backing to the aroma, but it takes a good huffing to even notice it. A dry citrus sensation slams into my taste buds. The taste borders on bitter, but there is a sweetness that pulls it back from the edge. Even though the bitter taste is a bit off putting, there’s something that has me wanting to drink it again once I set the bottle down. The carbonation level is on the lighter side, which works well with the bitter/tart tastes of the soda. An abundance of bubbles would just cause an attack on your mouth. Perhaps my normal person taste buds need work, but as far as I’m concern there might as well only be one ingredient in this soda. The other two listed ingredients just don’t seem to be altering the flavor. Perhaps it’s too subtle for a mortal. If you were looking for a soda that really nailed the taste of a Citrus x Paradisi then look no further. JOIA has that flavor down pat and bottled it. As an added bonus it’s quite refreshing, although this is a 80 degree day beverage not a 90 degree day beverage. All in all I’m rather pleased with this offering from the folks at JOIA and can’t wait to try a few more of their sodas.